Click through to see this weekend's art and the design requirements for your card submission, due Monday morning. Every submission warrants feedback, which I will try to provide, and which everyone is welcome to provide as well. Even better, we're going to give this challenge some goblin-y flair: Each design must one up the design preceding it in some identifiable way. We won't get very far just making more and more broken cards, but you can also trump a card based on flavor, randomness, emotional intensity, whatever. Just make it clear how your design is more than the previous one. Good luck and gob speed. If a spell or ability an opponent controls would cause you to sacrifice a creature, sacrifice CARDNAME instead. "Hey boss, we found the dragon's lair!" Starting off with a softball, I guess. A very nice design, though. Love the flavortext. Hang on-- this ability is a lot more narrow than I thought. Wouldn't you usually choose to sacrifice Goblin Vanguard anyway? Isn't the ability strictly a downside when you get hit with, say, Devour Flesh? I get that it's nice against Celestial Flare, but is there much of anything else like that? It works against some of the killspells that say "target creature's controller sacrifices it," and some other oddities such as that. It is pretty narrow, though. Add Haste? Make the sac ability work even if you control the source? Dunno. Make it playable without the super-niche ability? Make the ability less niche? "If a spell or ability an opponent controls could target CARDNAME, it must." Flagbearer tech could easily be red. I'd be interested in removing the "opponent" part of the sacrifice, though, and seeing if you could do something neat with, like Doomed Necromancer; but that's possibly untemplatable or strictly broken. Whenever you sacrifice CARDNAME, if it had any +1/+1 counters on it, return it to the battlefield with one less +1/+1 counter on it. Based on an existing design of mine. One-upping the sacrifice craziness. A 4/4 for 2RR in red with potentially triple-Persist seems very good. I might push for 1/0? It doesn't have any ETB abilities to abuse, and Ember Swallower says you can print a 4/5 for 2RR with substantial upside, so as far as I can tell the power level should be OK.
Ember Swallower is a rare. Fair enough. Let's make it a Hill Giant, then. 3R, 1/1, enters the battlefield with two +1/+1 counters. Sweet card. Assuming the template works, I'm not sure this is red. Probably black? CARDNAME must be blocked each turn if able. Whenever CARDNAME becomes blocked, sacrifice it. It deals 4 damage to each creature blocking CARDNAME. I infer from the flavor text that the name is meant to be ironic, but it's not working as a joke for me. It's just confusing. The rest is cool. Halfheart's guard for a mechanical connection? Not sure why a guard is charging ahead and blowing up, so I'm using Boggart Bombardier (and removing the flavor text). Other Goblin creatures you control get +1/+1 and have haste. They attack each turn if able and must be blocked if able. When a Goblin you control dies, all other Goblins you control deal damage equal to their power to CARDNAME. One-upping Tehwerr's "Must be blocked if able" theme. I felt the need to steer away from the not particularly red or gobliny theme of sacrificing but not dying. "All other Goblins" is functionally identical to "that goblin" unless it's a Lobbercrew. Otherwise, neat. High risk, high reward. Other Goblin creatures you control get +1/+1 and have haste. They attack each turn if able. Whenever another Goblin you control dies, it deals damage equal to its power to CARDNAME. Whenever CARDNAME deals damage, put a +1/+1 counter on it. Whenever CARDNAME is dealt damage, remove a +1/+1 counter from it. If you can't, sacrifice it. "So much to savour... So much to suffer..."
Some weird timing things happening here. If my freshly cast Hedonist blocks a 1/1, it ends up as either a 3/3 or a 2/2 depending on the order in which the triggers stack. Suppose it's 3/3, and the Hedonist subsequently gets blocked by a 2/2. Then if the second ability triggers first, there's a window after it finishes resolving when the Hedonist is a 2/2 with 2 damage on it and gets sent to the graveyard. Is this intended? Also, I'm guessing this could stand to be somewhat more powerful. Give it haste maybe? Correction: When a freshly cast Hedonist blocks, it either dies immediately or ends up back as a 2/2. That doesn't seem to be the intent of the design, so you should definitely consider modifying these effects. Or give it first strike, make it 0/0 and enters with two +1/+1 counters to begin with. It's neat that it gets bigger when it's unblocked, or if you give it double strike, but this template is confusing and will cause players to kill their creature when they mis-stack the triggers. "When CARDNAME deals damage, put a +1/+1 counter on it. At end of turn, if CARDNAME was dealt damage, remove a +1/+1 counter from it. If you can't, sacrifice it." Removes some of the issues, but still seems like it needs more of a reward for the hoop that is being gone through. Whenever a player puts a +1/+1 counter on a creature, that player puts it on a random creature instead. "Well we definitely paid *someone* for the work." My concern is whether this is worth executing. Similar effects have a fairly large impact based on the random result. This could require some serious work to figure out and just not matter at all. It could also happen A LOT. It would be printed in Commander supplemental products I guess. When Goblin Swindler enters the battlefield, each player discards a card, then draws a card. "Each player discards a card, then each player that discarded a card this way draws a card." Not sure how this one-ups the previous design, but I love the card. I want it to draw hellbent players cards. Whenever ~ deals combat damage to an opponent, put a +1/+1 counter on a random creature you control. 1R, discard a card: Target creature with power 2 or less can't be blocked this turn. One-upping the number of previous cards referenced, combining the last three submissions. Definitely not a NWO card though. I like both abilities, but I'm not sure why we'd put both on a single card. When CARDNAME enters the battlefield, exile all cards in all graveyards, then put that many gold counters on CARDNAME. T: You may play a random card exiled by CARDNAME. You may spend gold counters on CARDNAME as though they were mana of any colour to play that card. The one-upping is, of course, from a tomb raider to a TOMB RULER. ALL HAIL GOLDBELLY! "You may play a random card" needs some fleshing out rules-wise, and the card's P/T and play style make me think that this wouldn't normally be a Goblin. Otherwise, I like the concept a lot (including the meaning of gold counters). You are quite right on the P/T. Probably 2/4 is fine. As for the random templating, hasn't it been used be for? Maybe I'm wrong, but I could've sworn I've seen it before. Hrm. T: Choose a card exiled by CARDNAME at random. Until end of turn, you may play that card from exile and you may remove gold counters from CARDNAME to reduce its mana cost by one mana of any color. Can we play the random exiled card only while resolving the tap ability, any time this turn, or any time for the rest of the game? You both make very good template-y points. My intention was this, you tap him, as an instant, randomly choose one of the cards he exiled, and you can play it now, whether it's a land or spell, sorcery or instant. You can then use gold counters to get the right colours. If you don't play it now, then you don't play it until you tap him again and get it randomly selected. This is one of those things where templating may make something simple to understand too wordy to fit. But now, I think it's at least clear. It doesn't matter how often you choose an exiled card, the only time you're allowed to play it is when the tap ability picks it that time. It doesn't matter if it's been picked before. Is it worth allowing you to play lands, given the confusion over whether you can play them at instant speed, or an opponent's turn? Djinn of Wishes seems to think it's fine. The real confusion is that it doesn't give you an extra land play, so if you can't play a land and you get one, too bad. 1R, T: Destroy target artifact an opponent controls unless he or she lets you draw two cards. This is a very clever design. And oddly appropriate for this site as well as the in-world "Goblin Artisan" concept. Right, but I'd say this is actually a better design than that one. Not that making better use of old names is an option for Wizards. How does this one up Goldbelly? 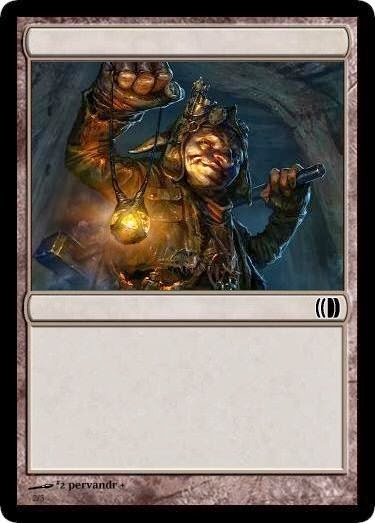 An argument: having a card a hundred years ago named Goblin Artisans and one in the modern era named Goblin Artisan is less confusing than, say, having two cards named Peace and Pierce Strider in the same set. As for Goldbelly, it one-ups it in "hitting close to home"-ness. When CARDNAME attacks, an opponent may choose to make it unblockable until end of turn. He gets by with a little help from your friends. "... an opponent may have it gain 'this creature can't be blocked' until end of turn." This could have a saboteur ability to give it a little more oomph. I like that this is predominantly useful for multiplayer, but also can come up in duels, as there, this can't be Lure'd. When CARDNAME attacks, any opponent may collude with you. If an opponent colludes with you this way, CARDNAME can't be blocked this turn. In trying to fix the templating, I added a keyword. Imagining the product this could be in, I moved the card up to common to emphasize the theme. A saboteur ability would make this more exciting, but I kinda like it as a piker for the collude keyword. 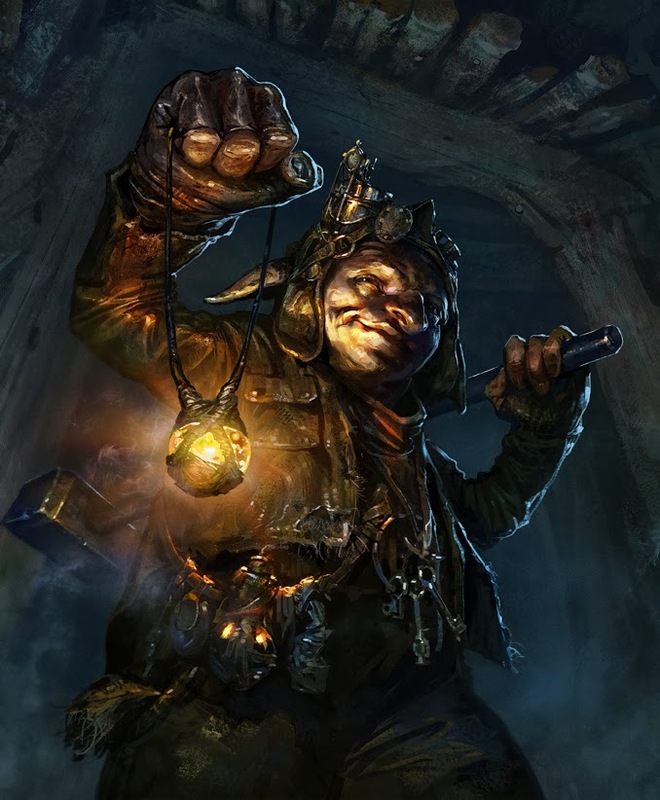 What saboteur ability would be best on an uncommon or rare? Something to introduce more politics? A keyword that requires more space than the thing being described isn't a very good keyword. This is especially true when the thing being described is rarely relevant in two-player games. Why not just "any opponent may have CARDNAME gain 'this creature can't be blocked' until end of turn"? Collusion — When CARDNAME attacks, any opponent may have CARDNAME gain "this creature can't be blocked" until end of turn. This design pisses off an hilarious subsection of players. Players too casual to appreciate that this is still a serviceable Goblin Piker, but who also hate multiplayer. Heh. When CARDNAME enters the battlefield your creatures get +1/+0 until end of turn unless target opponent flips a coin. if he or she loses the flip, creatures you control get +2/+0 and must be blocked by two of more creatures until end of turn. If he or she loses the flip, creatures you control get -1/-0 until end of turn. "I got what you need, probably." of course one-upping the opponent choice from the last guy. I'm assuming the second "loses the flip" should be "wins the flip." This is 9 lines currentlyt. I recommend ditching the flavor text. This would be cleaner if it were just +1 / +2 / -1 without the two-headed ability, BUT then it would usually be correct to flip because the difference between +1 and -1 is greater than between +1 and +2. 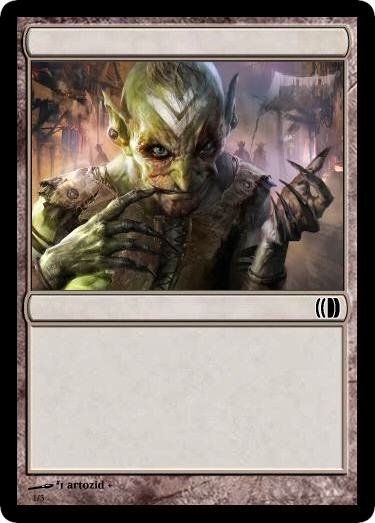 Target land an opponent controls gains "Goblins get +1/+1, Sacrifice this land: deal 2 damage to Goblin visionary (only controller of the land may activate this ability)"
"I see a future with dirt under our feet, and gold up to our ankles." trying to one-up my own opponent interaction. You get an award for one-upping your own one-up-ness. 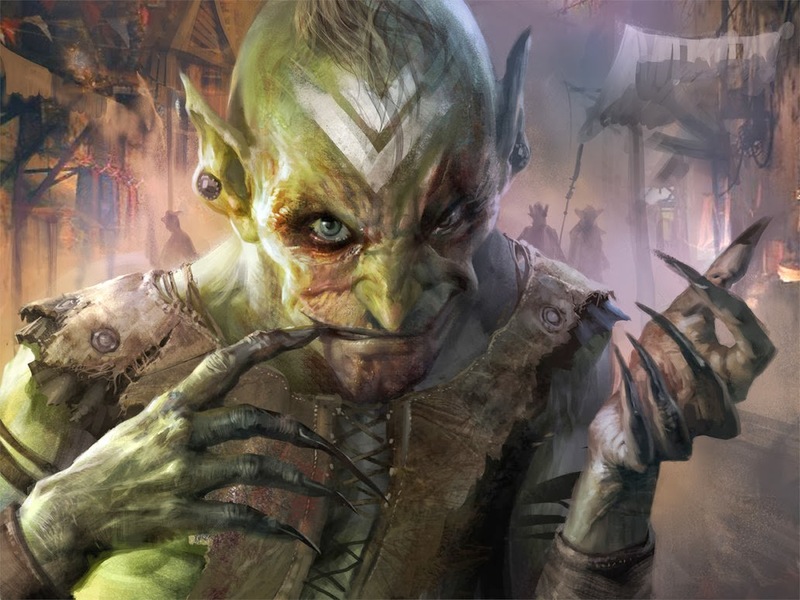 When CARDNAME enters the battlefield target land an opponent controls gains "Goblins get +1/+1, Sacrifice this land: deal 2 damage to Goblin visionary (only controller of the land may activate this ability)"
When CARDNAME enters the battlefield target land an opponent controls gains "Goblins get +1/+1." 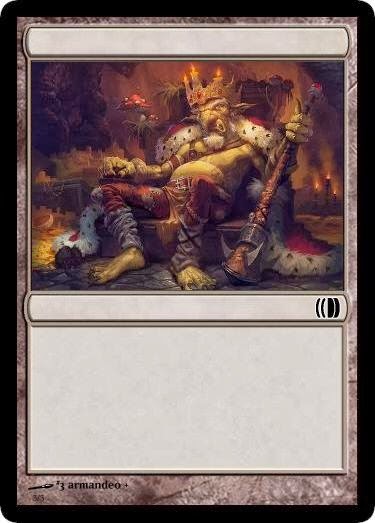 and "Sacrifice this land: this land deals 2 damage to Goblin visionary"
I'm not sure what the flavor is for the mtn-sac-burn-this-one-guy effect, but I get this is meant to be a 2cc punisher Stone Rain. If the opponent doesn't sacrifice immediately, I'm concerned there could be memory issues behind which land was targeted. And now I realize the challenge text has lost the explicit "one submission per person" direction. When ~ enters the battlefield each opponent may sacrifice a land. For each opponent who does not, goblins you control get +2/+0 and gain "this creature can't be blocked except by two or more creatures" until the end of turn. My concern with this is that it's better than Goblin Piker early but not late, which is the opposite of the kind of help Piker needs. I like what Mikko was doing with the goblin sabotaging the land. When Mana Miner enters the battlefield, target land produces colorless mana when it is tapped for mana instead of any other type until Mana Miner leaves the battlefield. When Mana Miner enters the battlefield, target land loses all abilities and gains "t: Add 1 to your mana pool" until Mana Miner leaves the battlefield. This is smoother than Goblin Visionary. I wonder if it's enough to make remembering which land was neutered sufficiently easy. Spreading Seas really wants to touch the land it enchants. When Goblin Mine enters the battlefield put a 1/1 red goblin token onto the battlefield. Enchanted land loses all abilities and gains "t: Add 1 to your mana pool"
"Goblin mines aren't know for what they produce, but rather for what they leave behind"
FYI, the flavor text pushes this common to 8 lines. +2: Put a 2/1 red goblin creature token into play with "When this creature dies, destroy target land"
-1: Deal 1 damage to target creature. That creature gains haste, and must attack this turn if able. 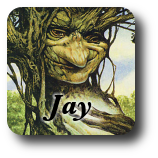 -7: Target player gets an emblem with "Creatures attacking you have plainswalk, islandwalk, swampwalk, mountainwalk, and forestwalk." starting loyalty: 2 or 3? Very cool. I'd suggest starting with 3 loyalty, getting a 1/1 Goblin from the first ability (which is pretty oppressive as is), and having the emblem say either "creatures attacking you can't be blocked" or "creatures attacking you have nonbasic landwalk". I agree with Ipaulsen, and would change the emblem to: creatures with power 2 or less you control cannot be blocked. "Creatures you control with flying can't block creatures without"? Why does a spelunking planeswalker whip creatures? 3 Loyalty sounds good lets try that. -9: sacrifice all goblins you control. Rukkuruk, Goblin Emperor deals 3 damage to target opponent for each goblin sacrificed this way. Clever use of loyalty-- I approve. Assemble the Goblins! 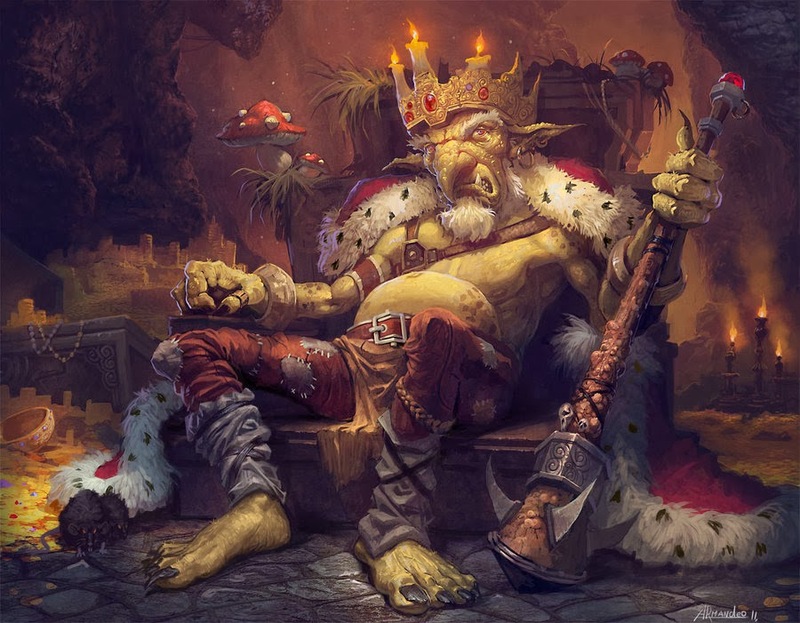 My only concern is that Rukkuruk can win the game on his second turn in a lot of goblin decks. Probably only in Modern? Quite possibly just fine. Yes, but he is a 6 CMC planswalker and requires your goblins to survive. At the beginning of each player's upkeep, that player sacrifices a creature and puts X 1/1 red Goblin creature tokens with haste OTB equal to that creature's CMC. At the beginning of each player's end step, each Goblin that player controls deals 1 damage to him or her. Aside from this exercise, I would love to see a card like this that mills instead of pinging. Might be URB? UR, or UB? Probably making artifact creature tokens with "At the beginning of your upkeep, put the top card of your library into your graveyard", to really hit the Sorcerer's Apprentice sort of flavor. Goblins have haste and must attack each turn if able. At the beginning of each player’s upkeep, that player sacrifices a creature and puts X 1/1 red Goblin creature tokens onto the battlefield equal to that creature’s converted mana cost. All other creatures have haste and attack each combat if able. Whenever a Goblin creature you control deals combat damage to a player, you may discard a card. If you do, draw a card. One-upping attacking. Everyone attacks, for better or worse! I love it, except for one word: "other". Why? Flarko sends everyone else to find shinies for him. At the beginning of each player's combat step, untap a random creature that player doesn't control. That player gains control of it until end of turn. That creature gains haste until end of turn and must attack this turn if able.